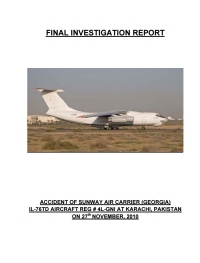 An Ilyushin 76TD cargo plane, registered 4L-GNI, was destroyed in an accident near Karachi-Jinnah International Airport in Pakistan. All eight occupants and three persons on the ground were killed. The airplane operated on a cargo flight from Karachi-Jinnah International Airport (KHI), Pakistan to Douala, Cameroon with a planned en route stop at Khartoum, Sudan. The flight was loaded with 30.5 tons of relief supplies (tents). After completion of necessary pre flight requisites by the flight crew, the cockpit crew contacted Karachi Airport at 01:14 hours local time and informed about their readiness to start for Khartoum. After receiving permission from the air traffic controller, the crew started the engines between 01:21 and 01:24. On previous flights the crew had encountered problems starting engine no.4. On those occasions the engine was finally started after switching on the Engine Anti Ice System. At Karachi, the flight crew proactively activated the Engine Anti Ice System before starting engine no.4. The most probable reason of abnormal starts of the engine no.4 was reduction of compressor efficiency because of blade wear. The service wear of blades increases axial and radial clearances and the blade surface becomes rough, thus reducing the compressor efficiency. With the inlet guide vanes heating mode on, the amount of air through the compressor’s first stages increases thus improving the start reliability. The crew then taxied the plane to runway 25L and took off at 01:43 hours. Shortly after takeoff, as the aircraft was climbing through an altitude of 100 meters, the no.4 engine suffered an uncontained failure. The airspeed was 325 km/h and undercarriage had been retracted. The remaining three engines continued working on takeoff power. The aircraft banked right, which the pilot tried to counteract with ailerons and rudder. The no.4 engine was then set to idle and subsequently shut down. Despite fully deflected ailerons and spoilers to create a left bank, the aircraft continued in a right bank. Right bank had increased to 32° while the recorded deflection of the rudder was -24° (to the left) and elevator to -10° for pitch up. The aircraft reached a height 140 m before it entered a descent. At 01:44 the bank angle became 71° to the right and the aircraft continued moving to right and impacted buildings that were under construction. The cause of the occurrence was uncontained failure of the 2nd stage disk of LP compressor of Engine # 4 due to fatigue fracture which resulted in in-flight fire and damage to adjacent areas of right wing / flaps to an extent that flight could not be sustained. The use of mishap engine beyond its manufacturer’s assigned life without assessment and life enhancement by the manufacturer was the cause of its uncontained fatigue failure. All operators and ground handlers are to ensure preparation of proper load / trim sheet while keeping maximum authorized allowable takeoff mass of aircraft / cargo loads for the specific type of aircraft. CAA, Pakistan should ensure proper preservation of all available evidences collected during the process of investigation till finalization of investigation. The Civil Aviation Regulatory Authority of the state to ensure institution and compliance of air crew training on the emergency procedures, related to the engine failure during takeoff. The D-30KP designer and manufacturer to conduct one-time inspection of the LP compressor 2nd and 3rd stage aft and fore ledges by the vortex-current method under the procedure prescribed by the Bulletin No 578??-?. To the Aviation Administration of the Kirghiz Republic to perform the check of the conformity of the maintenance company function – the Airline Transport Incorporation FZC Osh branch – to the Certificate Regulations. With a view to identify the engine after the air accident the designer and manufacturer of the D-30KP-1-2 shall introduce the engine marking that allows determination of its number in air accidents in particular and at the time of purchase for further operation. Georgian Aviation Administration to cooperate with the state of the designer when putting the aircraft into the state register as being the state issuing the Airworthiness Certificate. Notification on including the aircraft into the state register must be provided, the condition of continuing airworthiness of the aircraft and engines must be determined in accordance with the requirements applicable to the type of the aircraft. Aviation regulatory authority of the states which have the IL-76TD aircraft in the public register or under lease in the state airlines to organize the check of the log books of the D-30KP engines. Such checks to ensure that life limits, records and documentation are in conformance with Bulletin No 670-??-? dated 8th February, 2002. The results of the checks to be coordinated with the NPO Saturn, the manufacturer of the ?-30?? engines. The Civil Aviation Regulatory Authority of the states which have the IL-76TD aircraft in the public register or under lease in the state airlines to organize the check of the IL-76TD aircraft log books for following: - Assigned life limit observance till the first overhaul. - The presence of the life limit prolongation Permits (Conclusions) issued by the IL, JSC (manufacturer) till the first overhaul in accordance with the applicable bulletins on the subject. - The conformity of the issued (available) airworthiness certificates data to the assigned life limits till the first overhaul. - The results of the checks to be coordinated with the IL, JSC (Aircraft manufacturer) and NPO Saturn, the manufacturer of D-30KP engines. The airline management to ensure thorough check of aircraft and technical log books for correctness of records and trustworthiness of the life limits data while following the procedure of the aircraft inclusion in the Air Operator\'s Certificate. Moreover, required data as desired by investigation agencies should be provided. The airline management to ensure that at the time of delivery of the aircraft from the owner to the airline under lease arrangements the complete aircraft and technical documentation must be delivered to the operator. The management of Independent Certified Maintenance Organizations to ensure the availability of all applicable technical documentation, correctness of records and trustworthiness of the life limits data of the aircraft maintained by the organization. The Civil Aviation Regulatory Authority of the state to ensure that the continuing airworthiness aspects of the aircraft included in the public register, are in accordance with the Annex 6, 8 to the Convention on International Civil Aviation. Special attention to be paid to the airworthiness status of the aircraft included in the public register but operated outside the state of registry. The Civil Aviation Regulatory Authority of the state to ensure that in case of disclosure of the non-conformity or the violation of aircraft / engine life limits or TBO prolongation procedure the operation must be stopped immediately. Distance from Karachi-Jinnah International Airport to Khartoum-Civil Airport as the crow flies is 3721 km (2326 miles).